The Tour of Ulster started today in the Moy with 75.8 miles to cover over 7 laps of a 10 mile circuit. Shortly after the start 9 riders moved clear, they were Mark O'Callaghan (Aqua Blue Sport Academy), Anthony Walsh (Aqua Blue Sport Academy), Darnell Moore (Caldwell Cycles Omagh), Chris McGlinchey (Cycling Ulster), Lindsay Watson (Cycling Ulster), David McFall (Omagh Wheelers Cycling Club), Robert Jon McCarthy (Team Monaghan), David Watson (The Bike House CC) and Ian Richardson (UCD Cycling Club). 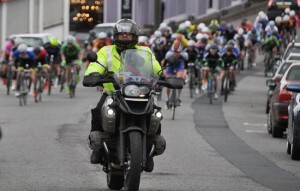 The Tour of Ulster started today in the Moy with 90.8 miles to cover. By the time the race reached the 1st KOH of the day at 7.7 miles covered a 5 man group had a 19 second lead over the main field. The group consisted of Marc Potts (Cycling Ulster), Lindsay Watson (Cycling Ulster), James Davenport (Strata3-Velorevolution Cycling Team), Adam Stenson (TEAM BIKEWORX Celbridge) & Cian O'Reilly (UCD Cycling Club). The Tour of Ulster starts this coming weekend and the line-up is impressive. 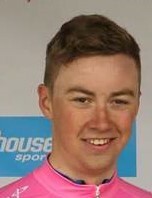 With the majority of riders coming from Ireland and looking to use this event as training for the up-coming An Post Rás it should make for an exciting race. This May Bank Holiday weekend sees the return of the ‘AmberGreen Tour of Ulster’ to the village of Moy in County Tyrone which will host the start and finish of all 3 stages, from 29th April to 1st May 2017. The AmberGreen Tour of Ulster is one of Ireland’s longest established races. Established in 1957, the race is attracting elite riders from across Ireland & the UK. Adam Ward of Powerhouse Sport continued to show his strength when he won the Lakeland GP yesterday. The event promoted by Lakeland CC saw the riders complete 90km over a rolly course with a couple of steep drags before the finish just outside Enniskillen. Gareth Murray of Ards, who has been getting in to the results recently, was second with Conor Devlin of Island Wheelers in third.